There’s a lot going on in Wisconsin and we want to tell you about it. Don’t worry, we’ll contain our excitement and only share what you’re interested in. If you have already signed up, you can also manage your subscriptions by entering your email adress above. Save money on your travels to some of Wisconsin’s best destinations. New deals are featured every month and we’ll make sure you don’t miss one. 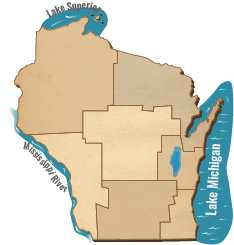 The best of Wisconsin in your inbox. Great events and fun things to do around the state delivered straight to you. Never miss one of our articles. Choose the categories you are interested in and we’ll send you an email when we publish a new article. Keep track of the fall color and find the best ways to experience them. We’ll make sure you don’t miss out on the peak color in Wisconsin. Stay on top of trail conditions (snowmobiling, downhill, and cross country) and learn all the best ways to enjoy winter in Wisconsin.